On May 1, 1637, Connecticut Colony declared war against the Pequot. This marked the first declared war in Connecticut between an indigenous people and English colonists. The conflict, though, had started well before the colony’s 1637 declaration. It stemmed from decades of tension and antagonism between not only the English colonists and the Pequot but involving Dutch settlers and other Native tribes as well. Although the war’s key battles in 1636 and 1637 marked the start and conclusion of the Pequot War, this still-controversial conflict quite literally bled beyond these chronological markers. In addition to the English colonists and the Pequot, the conflict drew the Narragansett, Niantic, Mohegan, Mohawk, Sasqua, and other tribes into the fray. Over its course, thousands would fight dozens of battles in Rhode Island and Connecticut. Confrontations occurred in the present day towns of Old Saybrook, Groton, Wethersfield, and Fairfield as well as in Mystic and on Block Island. The outcomes of the war, which included the enslavement and servitude of Native captives, influenced the future development and settlement of Native communities, especially the Pequot, and Connecticut society and culture. The Pequot War had long-term ramifications in colonial policy toward Native groups and had bearing on how additional American colonies, states, and our future Nation interacted with the Pequot and other Native tribes. 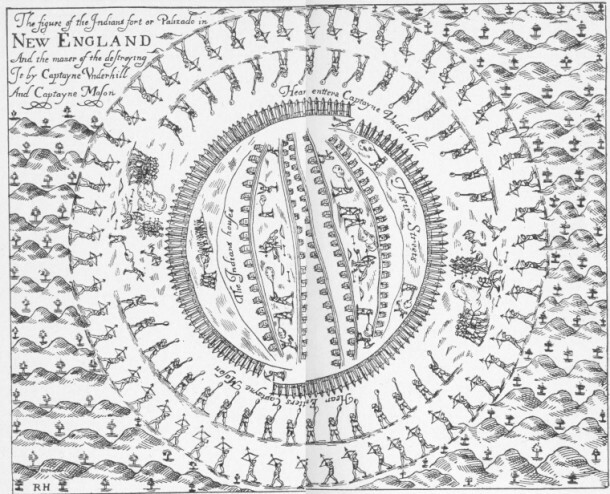 Contributed by staff for the Mashantucket Pequot Museum & Research Center’s Battlefields of the Pequot War project. “1637 - The Pequot War.” The Society of Colonial Wars in the State of Connecticut, 2016. Link. “Battlefields of the Pequot War.” Mashantucket Pequot Museum & Research Center, 2016. Link. Underhill, John. Newes from America; Or, A New and Experimentall Discoverie of New England; Containing, A Trve Relation of Their War-like Proceedings These Two Yeares Last Past, with a Figure of the Indian Fort, or Palizado. Edited by Paul Royster. Electronic Texts in American Studies. London, 1638. Link.